I recently started a part-time job at a library on campus, stamping and source-marking books and manuscripts in acquisitions. My first project has been to sort through a large array of broadside ballads and booklets of songs. Last Friday I happened upon something pretty great: the December 17, 1890 edition of the Dock, Wharf, Riverside & General Labourers’ Union of Great Britain & Ireland. 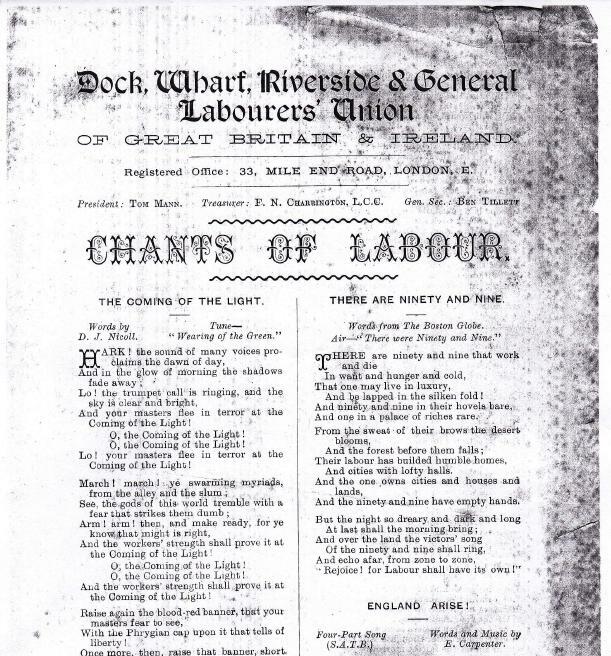 The issue is a collection of labor songs, and one on the front page struck me as particularly linked to contemporary issues. Unsurprisingly, it seems workers chanted against the stark inequality of the top one percent long before last September. Here’s a scanned copy, with the text below. “Chants of Labour,” from December, 1890.